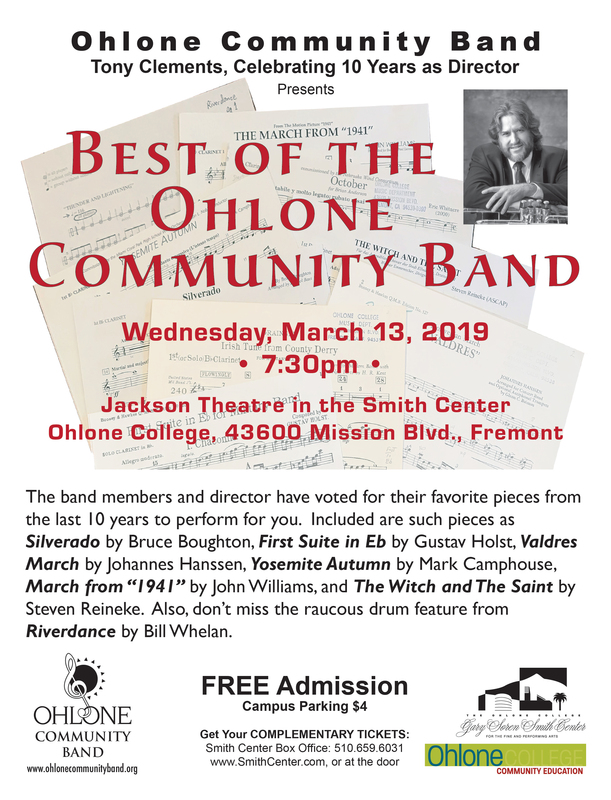 The old saying goes: “FREE is Better then Cheap!” So – the Ohlone Community Band (OCB) invites One & All to join us in the Jackson Theater of the Smith Center for the Performing Arts “On the Hill” at Ohlone College in Fremont – for an amazing FREE Concert performed by the amazing Ohlone Community Band. The 60 Band Members and Conductor Tony Clements have put together a FREE Concert of Band Members’ Favorites representing the Last 10 Years of music played by the Band under Tony’s leadership. And though all tickets can be obtained at the Smith Center Box Office for FREE – there is nothing “cheap” about the quality of the Band Music that this 40+ year old Ohlone College Music Machine will provide on March 13. 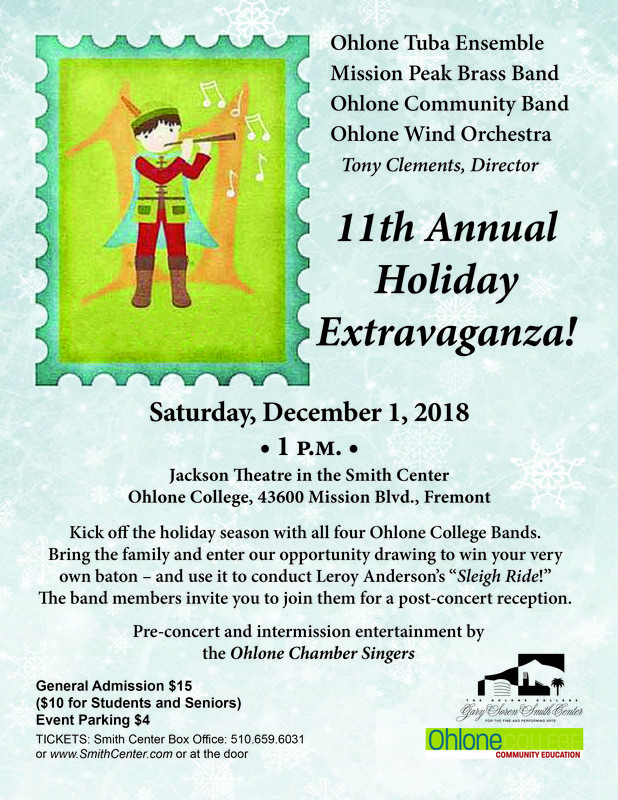 The Ohlone Community Band (OCB) is a self-funded part of the Music Course Offerings of Ohlone College Community Education. Membership is open to all Brass, Woodwind, String Bass & Percussion Musicians. We rehearse every Wednesday evening, 7:30-9:30pm, in TV Studio B (SC-144) on the Ohlone College Fremont Campus. And – in the Fall of 2019 we will be moving into the beautiful new Band Room (Room 2317) that is part of newly-constructed Academic Core of the Ohlone College Fremont Campus. The Mission Peak Brass Band presents a tasty “flight” of music for your listening pleasure. Soar with us, (and E.T.) in Fanfare & Flying Theme from E.T. The Extra Terrestrial by John Williams. We will reach new heights with Eagle Squadron March by Kenneth J. Alford and Where Eagles Sing by Paul Lovatt-Cooper. Additional pieces include Into the Future by Max Stannard and The Graces of Love by Oliver Waespi, among others. Our members have been practicing hard and certainly won’t be just winging it! 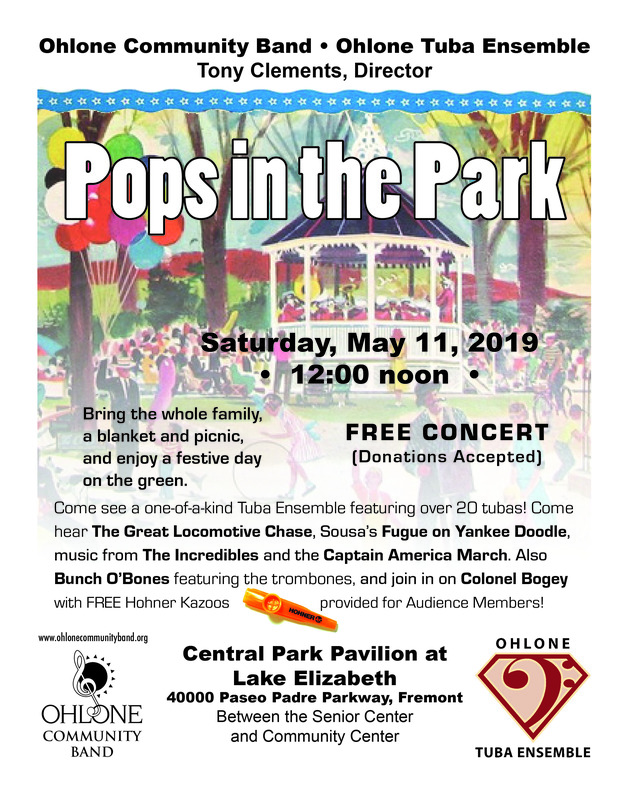 Ohlone Community Band – Free Concert! 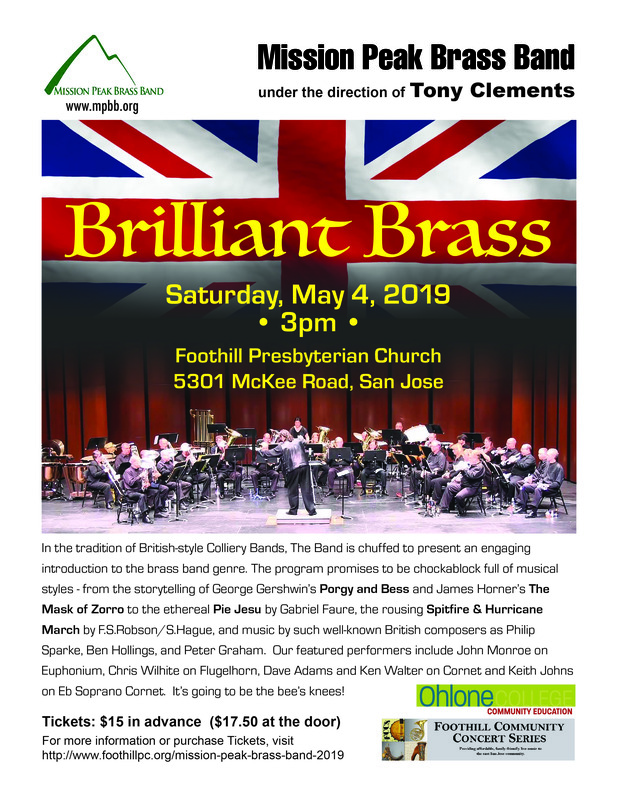 The Ohlone Community Band presents a concert to beat all concerts! All of our band members and director have voted – this concert will include our favorite pieces over the last 10 years. Included will be such pieces as Silverado by Bruce Broughton, First Suite in E-Flat (Chaconne) by Gustav Holst, Valdres March by Johannes Hanssen, Yosemite Autumn by Mark Camphouse, March from “1941” by John Williams, and The Witch and The Saint by Steven Reineke. Also, don’t miss the raucous drum feature from Riverdance by Bill Whelan. Free Tickets at the door or at the Smith Center Box Office on Campus. Parking is $4. This Saturday “On the Hill” at Ohlone College! All Four Ohlone College Bands conducted by Tøny Clements, plus the reignited Ohlone College Chamber Singers, conducted by Chad Cygan! Downbeat at 1:00PM (Rain or Shine!). Oh! 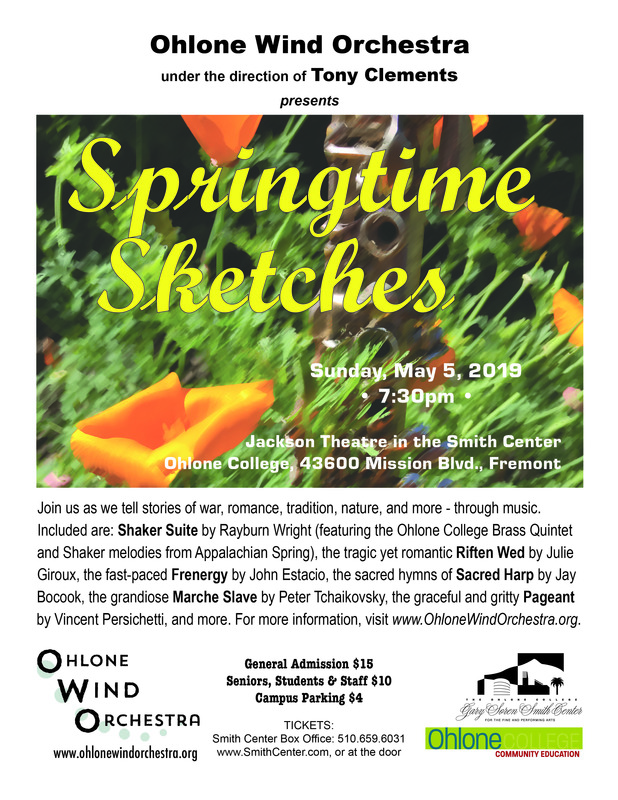 And a chance to Conduct the Ohlone Wind Orchestra! Be There!